Granted, Merriam Webster may be coming down a bit hard on the genre, but first-time visitors to the new Blues Burger Joint on Folly Road should note the large clue dropped by the name. Upon entry, the joint is dark and a bit greasy — even at high noon — but arguably that’s on purpose. With a menu focused predominantly on burgers, the low-key vibe is accentuated by the textured soundtrack and the tantalizing possibility of a vinyl record falling on your head from the ceiling above. The corner is occupied by a small stage (from which the volume can be pretty loud at night), and there are even a few ancient video games scattered about. 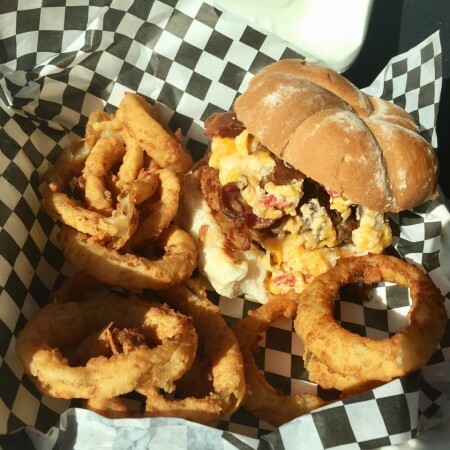 Blues Burger Joint’s menu features a handful of appetizers. 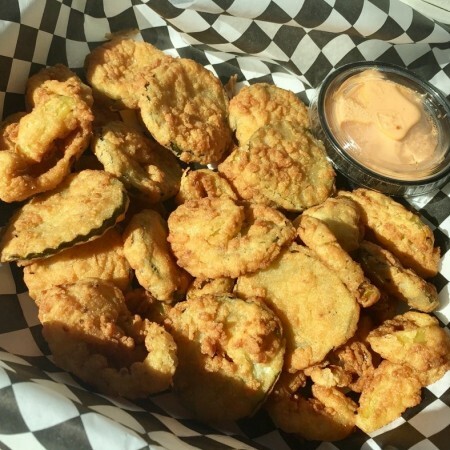 The fried pickles and peppers ($7) are pretty much exactly what they sound like. A generous portion of lightly battered rounds — predominantly pickles — arrived accompanied`by what was billed on the menu as ‘housemade ranch dressing,’ but in actuality was bright orange and chockablock with the unmistakable flavor of chipotle. 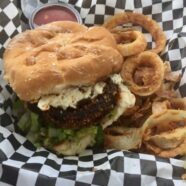 In contrast, it probably won’t come as a major shock that Sean Mendes, the owner of Blues and Roadside Seafood (which sits next door), also knows his way around a spicy crab cake ($11). Admittedly, heat is a bit of a trend, and the crab cakes are no exception with the occasional hunk of raw jalapeño sending things into overdrive. Pick those fiery suckers out if that’s not your bag, and you’ve got two thick meaty crab cakes worthy of your love and devotion. Although each component of the Southern gentleman burger ($10) is well-prepared, all together it’s a bit much. A rotund and audacious individual, he seems like he’d be a lot of fun, perhaps the dry, overcooked patty sucked the life out of him? The playful mix of pimiento cheese, fried green tomatoes, and bacon sounded equally compelling, but just didn’t work for me. This leaning tower of Dixie found too many discordant flavors competing for attention. On the other end of the spectrum, the Bella ($8) — Blues’ sole vegetarian entree — may be the most monochrome sandwich I’ve ever encountered. A large, panko-crusted Portabella cap is deep-fried and filled with goat cheese. Topped with lettuce and tomato on the same soft, sweet bun, it mostly tastes like eating a fried mushroom sandwich, which is to say juicy, but bland. Happily, this gripe is easily fixed by a different cheese or some of that horseradish mayo that is featured on the flat iron steak sandwich ($10). Speaking of which, that thing is finger-licking good. Not that you do that. A grilled hoagie roll is smeared with the aforementioned horseradish mayo and filled with surprisingly tender chunks of steak. Remarkably, they were cooked medium rare as ordered, an exceptional achievement considering the small stature of the cubes. Topped with sautéed mushrooms, onions, and provolone cheese, this sandwich is the bougie answer to a Philly cheesesteak, and it’s about time somebody came up with it. 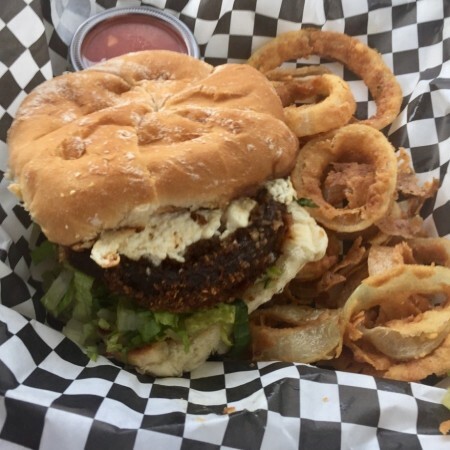 Blues Burger Joint’s service is competent and almost friendly. It’s not the kind of place for effusive attention, which is fine by me. Oddly enough, after an evening at the Joint, I kept thinking I smelled donuts. That sugar-meets-deep fryer aroma materialized wherever I went, a downright enigma until I realized it was my hair. Much of the restaurant’s menu is fried and the smell permeates everything, including (seemingly) the clientele. This is why it’s so paradoxical that the fries, sweet potato fries, and onion rings were pitted in a three-way tie for weakest link. Limper than a wet noodle and flinchingly over-seasoned, the traditional potato variety look handcut, but had the floppy texture of a fry fresh from the oven. Alas, the same ‘hot, but soggy’ fate befell the sweet potato fries. Due to their higher moisture content, sweet potatoes require a soak/dust/double-fry technique to crisp up properly. These are not those. For what it’s worth, the fries are the sideshow and not the main event. 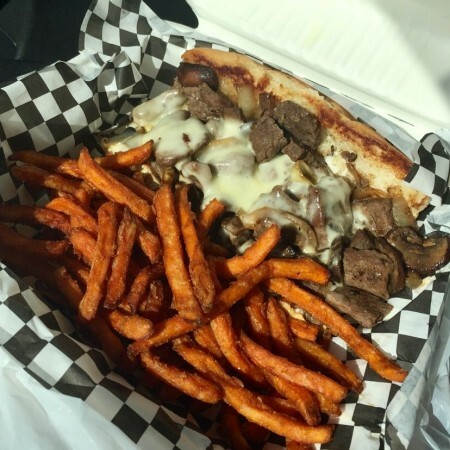 If I had to pick between crisp fries and the perfection that was the flat iron steak sandwich, well, I know where to get my fix.